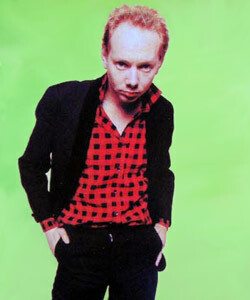 Joe Jackson Biography, Discography, Music News on 100 XR - The Net's #1 Rock Station!!! David Ian Jackson was born on August 11, 1954, in Burton-Upon-Trent, Staffordshire ENGLAND; although when he was just a baby his family moved to Portsmouth. In his childhood, Jackson played the violin and piano and in 1971 he entered the Royal Academy of Music in London on a scholarship. Whilst continuing with his studies, Joe Jackson also played in a couple of Pop bands and this is apparently where he picked up the name 'Joe'. He also played in the National Youth Orchestra, but he soon veered back into the world of pop. It was in January 1979 that Joe Jackson made his breakthrough with the brilliant LP "Look Sharp! "; recorded with his new band, Gary Sanford on guitar, Graham Maby on bass and Dave Houghton on drums and released by A&M Records, the album hit the top 20 in U.S. and scraped the lower reaches of the U.K. Top 40; the extracted "Is She Really Going Out With Him?" peaked at #21 on the U.S. Pop Singles chart and made the U.K. Top 20. Although Jackson was extremely busy on an international tour, he even found time to record his follow-up album, "I'm The Man", which was released in October 1979; reaching #12 in the U.K. and a respectable #22 in the U.S. the album managed to net him a #5 hit in his homeland with the insightful "It's Different For Girls". When Joe Jackson went into an East Berlin recording studio with the rhythm section that has accompanied him, off and on, for nearly three decades, he had the most strikingly simple line-up in mind: just piano, bass, drums and his unmistakable, eternally yearning voice. The result is his new album, "Rain", which will be out in stores January 29, 2008.